Posted February 11, 2016, in Student Alumni. 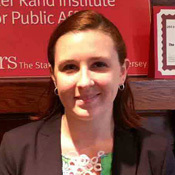 Caitlin Boehmcke holds an MA in Criminal Justice from Rutgers–Camden. She served as a facilitator to the Greater Bridgeton Area Breakout Group for the Cumberland County Prevention Project. With an academic background in sociology and work background in education, her areas of interest include alternatives to incarceration for juvenile offenders and the efficacy of various re-entry and job training programs for ex-offenders. She hopes to pursue a career in research informing public policy after graduation. This page was printed from http://rand.camden.rutgers.edu/2016/02/11/boehmcke-caitlin/ at 9:08 PM Saturday, April 20, 2019.